Telzio is a telephone service provider, which enables companies and organizations to manage their phone systems in the cloud. Our approach to phone service focuses on simple configuration, elegantly designed management tools, and flexibility to adapt. We’re here to help you build a professional phone system, with guides and resources each step of the way. On this page, you’ll learn how to start using Telzio to make and receive telephone communications. Telzio is a web-based application that works in most browsers, so you don’t have to download or install anything on your computer. We offer a number of guides, tips, and insight on how to use our features and services. Visit our searchable Support Center to learn more about how something works. When you signed up for an account with Telzio, you provided basic information like your email address, name, and contact number. The next step is to set up your payment information, including payment method and billing address. Telzio offers prepaid services, which means you will never be sent a bill. Charges are debited from your Telzio account balance, so it’s important to maintain a positive balance to keep your service active. Navigate to the Billing page, and scroll down to Billing Address. Enter your company name, contact, and billing address in the fields provided. When you’re finished, click Update Details. Navigate to the Add Credits section on the Billing page. Enter the amount you would like to deposit in the field provided. Our prices and payments are always in US dollars. Choose your payment method from the options provided. Follow the prompts to complete your payment details. When you’re finished, click Add Credits. Each payment method has a different transaction processing fee, which is displayed after you enter a deposit amount and select a method. There is no processing fee incurred when paying with Bitcoin. 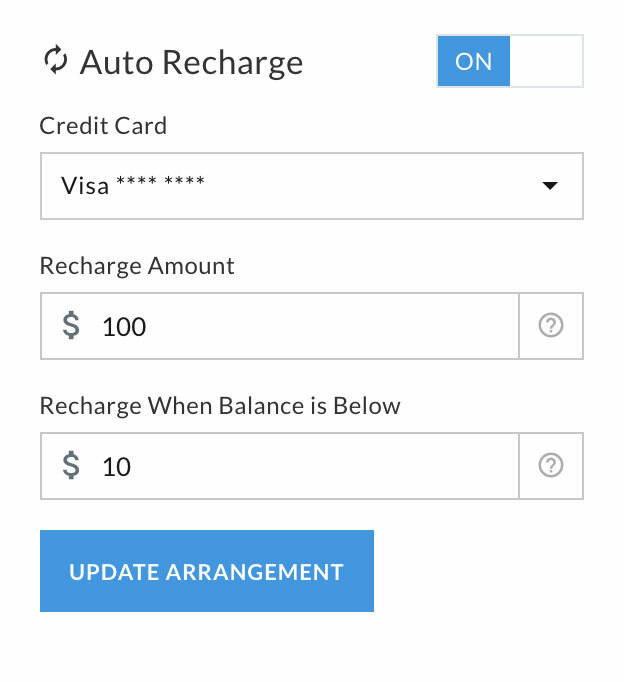 You can keep your balance in good-standing by enabling Auto-Recharge, which makes an automatic deposit to your Telzio account from your existing payment source when your balance gets low. You can set the balance threshold and deposit amounts by entering them in the fields provided. Your monthly statements and deposit receipts will be delivered to the email address you used to sign up, and you can also find them on your Billing page under Statements & Receipts. This will be the email address that also receives other important notices about your account. You can change this email address on the Account Settings page under the Details section. Once you have your account and payment information complete, you can immediately start adding phone numbers to your account. You can port existing phone numbers from your current provider to Telzio, and also register new phone numbers on the Plans & Numbers page. If you don’t have existing numbers to port or want to start out with a test number, skip down to the Getting Numbers section of this article. You can submit a porting request to transfer existing phone numbers through our website. Most portings are completed in 3 to 10 days, and you can avoid any downtime during the porting process by following the instructions. You’ll be notified by email of the date and time the porting will be complete, so you know exactly when the service will transfer and can prepare accordingly. It’s important to provide complete and accurate information in the porting request to avoid any delays. Make sure to also continue service with your current provider until after the porting date. Navigate to the Porting page. 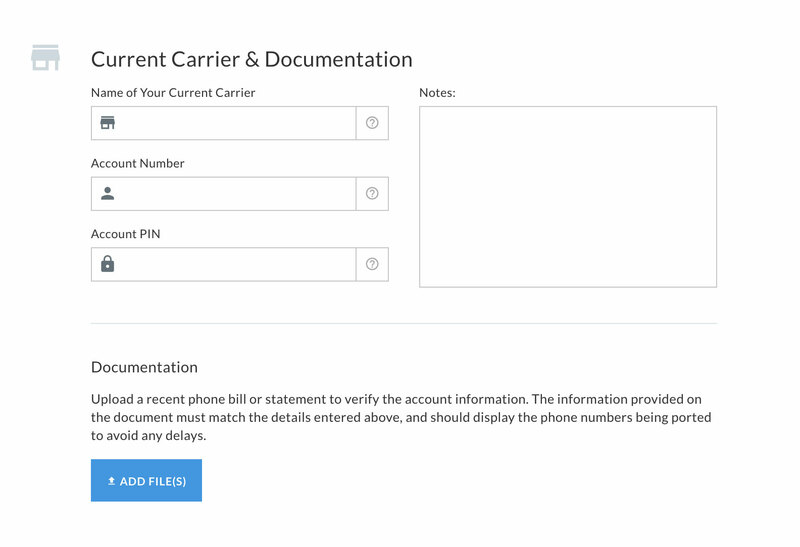 Under, Current Carrier & Documentation, enter the Name of Your Current Carrier, your Account Number, and Account PIN in the fields provided. Under Documentation, upload a recent phone bill, statement, or other document that verifies the account ownership, and click Add File. Make sure the information on the document matches the information entered above to avoid any delays. Under Numbers, enter the phone numbers you’re porting. If you’re porting numbers from multiple carriers, you’ll have to submit a separate porting request for each carrier. When you’re finished entering all the correct information on this page, click Next. Review the information on the following Porting Details page, and click Next. Read and sign the authorization form on the following Confirmation page, and click Confirm. You’ll see a final confirmation page, which means your porting request was submitted. When your porting request has been accepted by the current carrier, we’ll send you an email with your porting date. Look out for this email so you’re prepared for the switch. Before your numbers are ported, you’ll want to make sure you have a plan in place. Click on the Plans & Numbers page, where you’ll find your pending numbers. Click on a number to assign it to a plan. On the next page, you can customize a plan based on your usage. Move the cursor to the right to add minutes and text messages to your plan. You can see how the price changes under the Plan Details as you slide the cursor. All of our prices include taxes and government assessed surcharges. The price you see here will be the price you pay. When you finish building your plan, click Next. You can always come back to this page anytime to modify your plan. Review your plan and total due on the following page, and click Next. You’ll see a confirmation page, which means your numbers will be ready for use once they port. You can preconfigure your Telzio services and phones, so your system is instantly up and running when your service transfers. Jump to these pages or continue reading to learn how to set up your service. You can get local, toll free, and international phone numbers from over 60 countries on our website. Phone numbers are registered instantly, and can be used from any location. You can browse for numbers by country and area code, and search for special vanity numbers. Navigate to the Get Number page. Select the country where you want a number. Choose either Local Number or Toll Free Number. Next you can search for numbers and filter them by area code and prefix. Click on Filter by Area Code to view a list of all the available area codes, and select your desired area code. Next you’ll see a list of all the numbers available in the area code you selected. You can narrow the list down further by prefix. Prefixes are the first 3 digits of a phone number following the area code. Click on Filter By Prefix to view a list of all available prefixes for that area code, and select your desired prefix. Start typing in the Search field at the top of the page to search for specific numbers within the parameters you selected. Click on Number or Setup Fee to sort the columns. When you find a number you want to register, click Add. You can add multiple numbers on this page. To remove a number, click Remove. On the following page you’ll customize a plan to fit your usage. Move the cursor to the right to add minutes and text messages to your plan. You can see how the price changes under the Plan Details as you slide the cursor. It’s okay if you don’t know how much usage you’ll need. You can monitor your usage throughout the month and update your plan anytime. When you finish building your plan, click Next. Review your plan and total due on the following page, and click Next. You’ll see a confirmation page with your new numbers, which means they’ve been successfully registered.You can always add more numbers later and add them to an existing plan. The next step will be to start configuring your numbers. Before we get too far with that, let’s add some users to your system. Users are sub-accounts with unique logins that enable your employees to use your phone system. Unlimited Users are included with your Telzio service. Employees can log into multiple devices with their User, including IP phones and our mobile app, and be connected from any location. Users can also log into our website, where they can manage their calls, messages, and user preferences. You can grant different permission levels for Users, and allow them to have certain administrative abilities. Enter a unique Username. The username must be at least 8 characters. Enter a Password for the user. Passwords must be at least 8 characters and contain a number. Note that passwords are case-sensitive. Select the User’s Outbound Phone Number from the numbers in the drop down list. This will be the phone number from where the User dials out and the associated plan where minutes will be used. Enter a 3 or 4 digit Extension for the User. Users can call each other directly by dialing their extension, which does not use up any minutes from your plan. Select a Group for the User. By default, you will have an initial group called Main Group. You can add, edit, and delete Groups on the Users page. Users will have access to the pertaining sections in your account and have the ability to add, edit, and delete Call Flows, Plans and Numbers, and Users based on your selection. You can change Users’ permission levels anytime on the Users page. Mark the box next to Send Credentials to generate an email to the User with their username and password. Once they receive their credentials, Users can log into their devices to start making calls and log into our website to manage their communications and settings. When you’re finished with the User details, click Add User, and you’ll be directed back to the Users page where you’ll see a list of your Users. 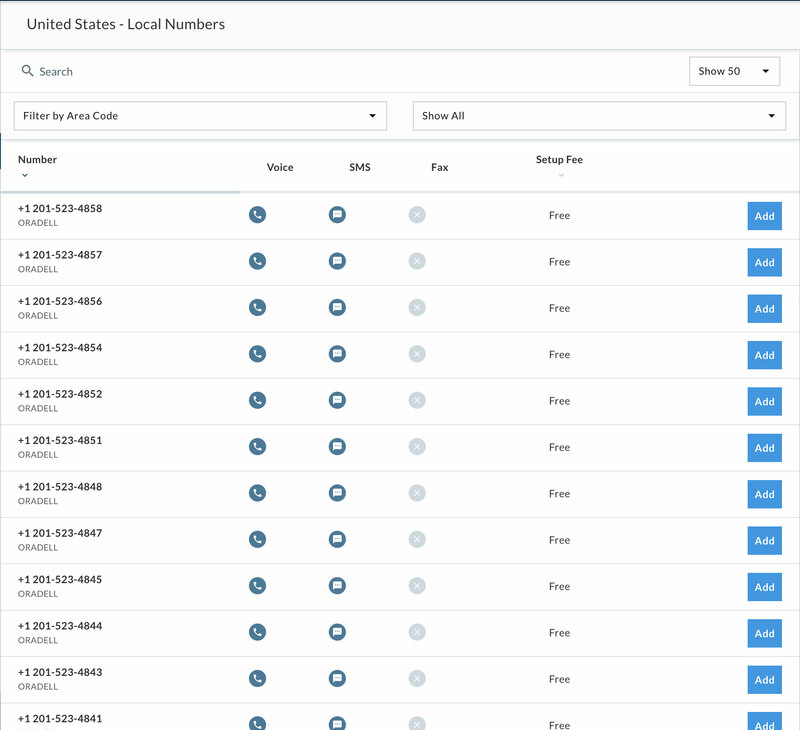 Now that you have a phone number and users, you’ll need to configure the instructions for routing incoming calls to get your number working properly. We call this configuration the Inbound Call Destination. Click on a phone number or plan to expand its details. 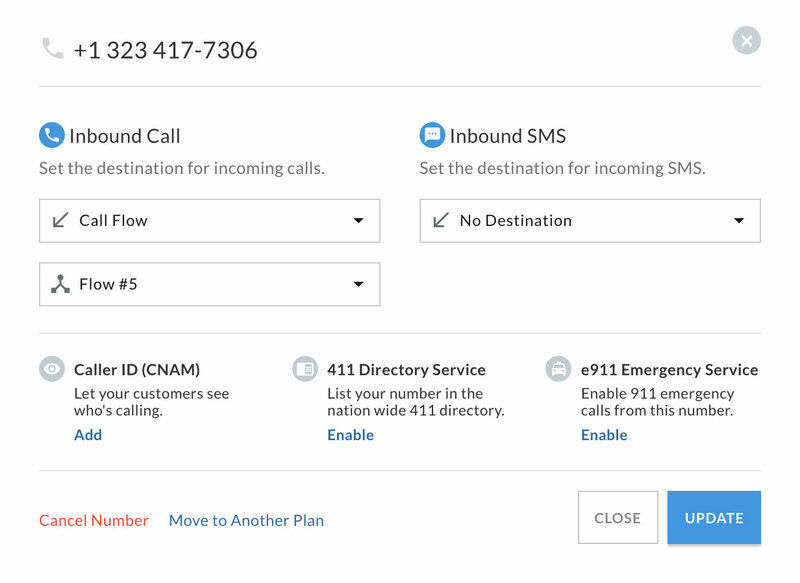 Click on the phone number to edit its Inbound Call Destination. Next you’ll see a window with inbound settings for your number. Call Flow A Call Flow is an arrangement of features and settings you can customize to automatically route incoming calls. In order to enable a Call Flow, you will first have to build one. Learn more about Call Flows. You can choose to send all incoming calls to one User. You can forward calls to a group of Users such as a department, team, or location, and prioritize calls in the order listed or try all Users simultaneously. You can add a list of phone numbers to forward incoming calls to, such as cell phone or landline numbers, and prioritize calls in the order listed or try all numbers simultaneously. You can convert your number into a fax line by selecting Fax. You can direct incoming faxes to a User, Group, or Email, and send faxes on the Fax page. You can send all incoming text messages to a User. You can send all incoming text messages to a group of Users. You can send all incoming text messages to an email address. You can send all incoming text messages to another phone number outside of Telzio. Note that if you reply to a text message using this method, the message will be sent from the external phone number. You can customize your caller ID to show your business name. You can add your business number to the national 411 directory. You can enable emergency calling from your number and add your physical address location for emergency responders. After you’ve defined your inbound destinations and add-ons, click Update, and you’re all set! Your number is now ready to receive calls. You can update these settings anytime by visiting the Plans and Numbers page. When you’re familiar with how to use our basic tools, review our optional advanced features to take your phone system to the next level.